I would be the first to say that Germany is a really awesome country. However, there are just some days where I just really miss home, you know? Solution? Comfort food, piping hot from my brand new mini oven. 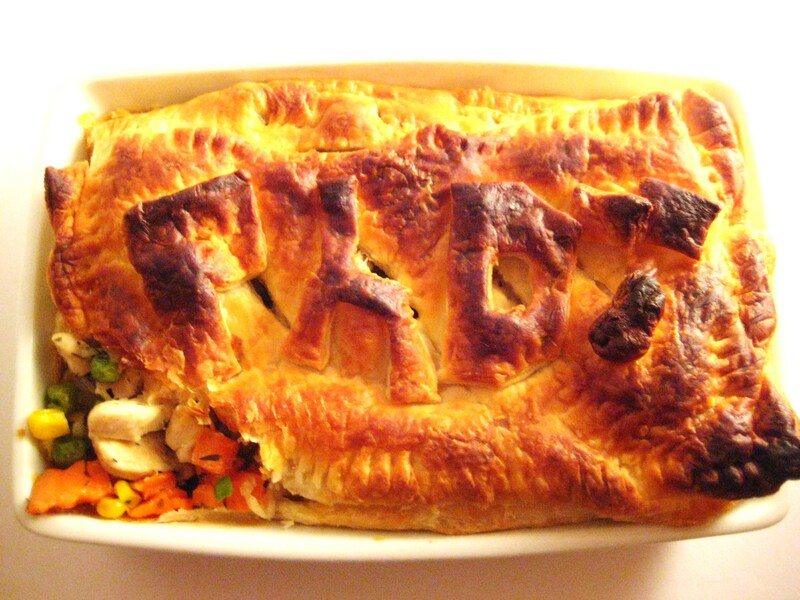 I have really good memories of chicken pot pie, most of them with my awesome brother. When Mum and Dad would go overseas to Asia for a week or two, Mum would always make sure to stock up the fridge before she left (this was when we were about 15, 16 or so). 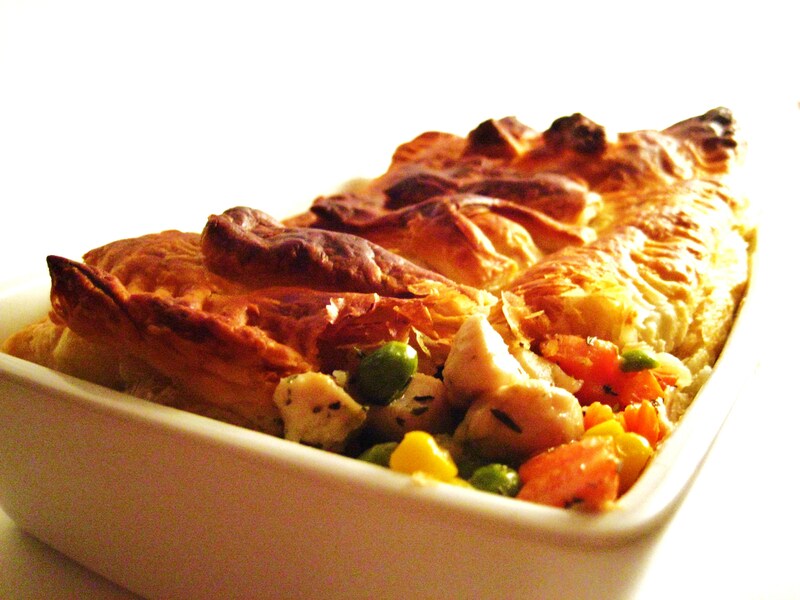 We had this one spurt of time where Al and I were absolutely crazy for chicken pot pie – we were eating two or three a day – so we always had frozen ones in our freezer. It was just so nice to open up the freezer, pop a pie onto a plate, microwave for 3.5 minutes, and open the door to smell the warm, aromatic smell of steaming chicken and vegetables in cream sauce. And that was really, to me, the other great selling point of chicken pot pie. It was just so easy and fast. Usually, pies can be quite time consuming because it takes a while to make the crust if you’re going to make it from scratch. Here, I’ve substituted blätterteig, since I made it on a Tuesday night between loads of laundry and piles of homework. I’ve also used frozen veggies – really, I think they have an undeserving bad rap sometimes – because I just don’t have the time or patience tonight to peel and chop up fresh ones. Cut chicken breast into 1.5cm cubes. Smaller cubes means that the chicken cooks more evenly, and soaks up more sauce. Fry chicken bits in pan with a bit of oil. 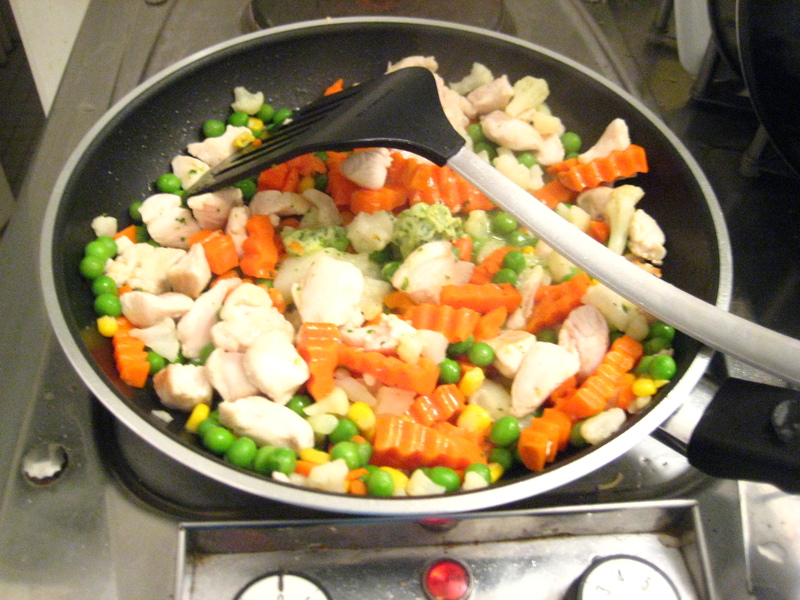 Add frozen veggies and stir until thoroughly heated. Add butter and let it melt. Add flour and mix so that there are no lumps. Then thin out the roux with milk. Season mixture with salt and thyme. Line baking dish/ramekin with the dough and trim excess (or you can fill the pie, then fold over the excess). 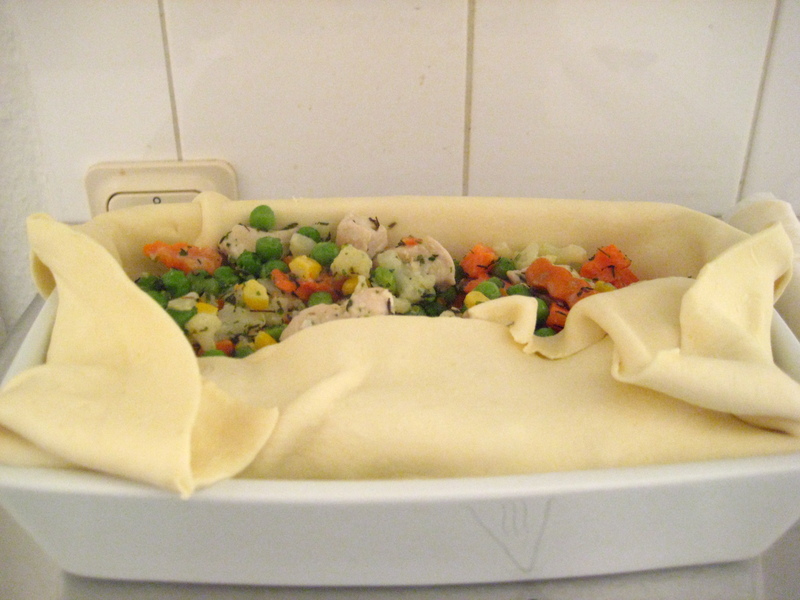 Fill dish with chicken and veggie mixture and cover with more pastry dough. Make some slits in the top of the pie to allow steam to escape. Bake in oven at 200C for 40 min. This may vary for your oven, since I have a mini oven! 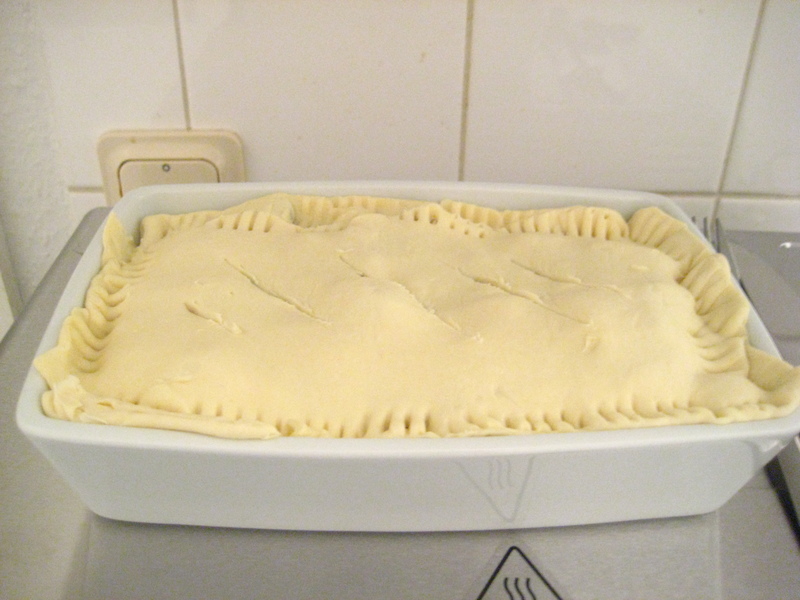 A good way to know when your stuff is done is when the pie starts to turn brown at the edges – the filling should already be properly cooked, so all you’re doing is heating up the pastry dough. Remove and serve piping hot! The thyme (which I think goes very nicely with chicken) is optional and substitutable, of course; you can also use chilli powder, normal salt and pepper, rosemary or some other savoury herb or herb mixture, or even curry powder, for a bit of a kick. You can, of course, also substitute chicken for beef, pork, or turkey, though with beef, you might want to use gravy instead of a white roux. For veggies, of course, you can use all sorts – onions, leeks, roasted garlic, potatoes, etc. It’s easy to make this recipe your own, and really rather difficult to screw up (especially if you buy the dough premade…but making it is also simple enough, just time-consuming) – comfort food in a flash! I want a poutine recipe, hehe. i want to make a poutine recipe!